Individually, Fran helps with Katherine’s ease of travel – most importantly keeping her safe when crossing streets. But the larger community can benefit from the presence of guide dogs in many ways as well. “Guide dogs give people with disabilities a friendlier image and make them more approachable to the community,” Schneider says. She also believes that guide dogs help educate the community and demonstrate how smart dogs can be. Schneider has done a lot to educate the community on her own as well. She has authored a humor-infused children’s book (appropriate for all ages) entitled Your Treasure Hunt: Disabilities and Finding Your Gold that addresses the issue of coping with a disability. She also penned a memoir called To the Left of Inspiration: Adventures in Living with Disabilities. To include other voices on the subject, Schneider even fostered a lecture series in 2009 through UW-Eau Claire. Another local author, Kathy Nimmer, who wrote the book Two Plus Four Equals One, will be discussing material from her book at the forum this fall. 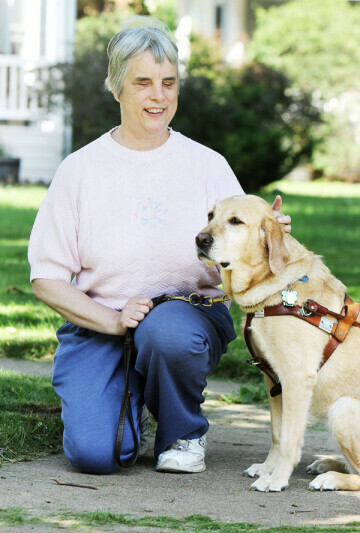 Schneider says that before official guide dog training begins, a willing volunteer (or a whole family) must first live with the dog for about a year to get them socialized – an initial service she refers to as “a great gift.” Some Eau Claire residents are giving this gift by raising guide dogs through an organization called Leader Dogs for the Blind. The process starts with puppy-raising. Karen Voss is one of six puppy raisers in the Chippewa Valley area. Having raised over 20 puppies from the ripe young age of eight weeks to the maturity level of one year, Voss knows how important it is to socialize the puppies early in their lives. She takes them places they will likely frequent in the future such as churches, grocery stores, and other public places. “Many businesses are very familiar with our pups in their blue capes, and welcome us to visit and shop,” says Voss. After teaching the dogs the basics of obedience and exposing them to public environments, the puppies with go on to the next program, aptly called Leader Dogs; this will be their final step before they begin helping a blind owner. UW-Eau Claire and McIntyre Library have found a way to become involved in the local presence of service animals by offering students a de-stressing zone during finals week. Every finals week since Dec. 2010, the library has hosted certified therapy dogs one night and retired/active guide dogs on another night. The interaction, which occurs inside the library itself, gives students a much-needed respite from studying, but the pups also benefit by getting attention. “The biggest thing for me that people take away is that they smile… it is a very stressful time and if students get it relieved by petting a dog, even if for ten seconds, then I have accomplished my goal of de-stressing students,” says Eric Jennings, Instruction and Outreach Librarian at McIntyre Library. He mentions that although this free and well-attended event caters to students, anyone is welcome. Founded in June 2001, Nature’s Edge Therapy Center in Rice Lake provides services through the use of animals that go beyond conventional expectations. Nature’s Edge offers therapy to patients with conditions such as autism, brain injury, and cerebral palsy. Through animal-assisted therapy, patients simply spend quality time with a variety of animals – the usual cats and dogs alongside sheep, pigs, chinchillas, and rabbits. They also offer more unique treatments. Hippotherapy, or “treatment with the help of horses” as it translates from Greek, entails a therapist who guides the patient through various positions atop the horse, including stretches and sometimes games. Through these activities, patients make progress in physical and/or occupational movements and even speech. The presence and variety of service animals in the Chippewa Valley wouldn’t be as prominent or even possible without the support of local residents. Whether it’s training guide dogs for the blind, allowing your pet to become a therapy pet, or contributing to a fundraiser or organization, the involvement of locals reflects the togetherness, compassion, and consideration that exists throughout our community. Visit LeaderDog.org for more information about becoming a volunteer puppy raiser. If you are interested in learning about the certification process for therapy dogs, contact Karen Rude through rudedogu.com. Nature’s Edge welcomes donations and sponsorship of patients or therapy animals and offers volunteer, employment, and internship opportunities.